Given the stakes involved in large, cross-border matters—U.S. 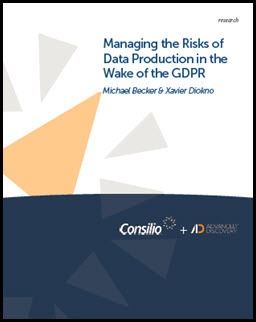 discovery sanctions versus GDPR violations that can reach up to 4 percent of a company’s global annual turnover or 20 million Euros, whichever is greater—companies must reconcile the requirements of the changing data privacy landscape with their eDiscovery obligations. Fortunately, by using technology to reduce the amount of personal data retained and outsourcing to shepherd that data through the eDiscovery process, companies can affordably achieve workable solutions that serve both masters. Read the full article from Michael Becker and Xavier Diokno.